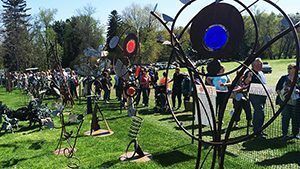 Crafts at Lyndhurst showcases over 275 modern American makers, artists, designers and craftspeople from across the country selling their exciting contemporary creations and is a celebration of all things handmade. A full day art and shopping experience for the entire family including interactive kids activities, delicious gourmet foods and concessions, hands-on demonstrations and more at Westchester’s favorite out-of-the-box shopping experience. Admission: $12; seniors $11; kids 6-16 $4, under 6 free. Free to Lyndhurst Members. Under tents. Rain or shine. No pets allowed within the show site. Visit www.artrider.com for discount coupons, group rates and more information. If you are interested in becoming a vendor or exhibitor, please contact ArtRider directly online or by calling 845.331.7900.